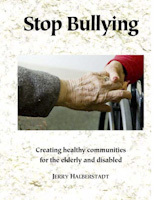 I write to seek your advice and help to resolve the problem of bullying in multifamily public and subsidized housing, the home to 92,000 residents, including elderly and people with disability. Bullying infringes on the right to peaceful enjoyment and there is no relief for individual victims or accountability for landlords who fail in their legal responsibility to maintain peaceful enjoyment. I believe it is well established in federal and state law that the landlord has a clear legal obligation to assure the peaceful enjoyment of all tenants. However, accountability is lacking. Hostile environment harassment may consist of bullying and harassing victims and is a violation of both federal and state law; it is unwelcome conduct that makes it difficult or impossible for victims to have the peaceful enjoyment of their residency. Peaceful enjoyment is the right of each tenant to enjoy the use of their home and common spaces without interference. Mobbing takes place when a community harasses a victim, and when the leadership—the landlord—fails to stop it. Individuals protected under civil rights may receive some limited protection, however the problem in housing is truly an equal opportunity activity that can harm any or all residents. We are pursuing administrative and legal remedies to provide rapid relief and protection for victims and whistleblowers. The agency or investigators who would act on such complaints under the proposed legislation may find a more general problem such as hostile environment harassment. At present, there is no remedy. Where the landlord fails to assure peaceful enjoyment and there is found an atmosphere of mobbing and hostile environment harassment, a victim can in theory bring a civil suit. However, residents of public and subsidized housing cannot afford such action. In such a situation, can the Commonwealth step in? Does your office or the offices of the district attorneys have an appropriate legal mandate? We wish to investigate if there may be legal actions which your office or the several district attorneys could take to bring a civil action to protect the rights of victims and to hold a landlord accountable. For example, M.G.L.c.12 § 11H may possibly enable the Attorney General to provide protection and remediation on behalf of a person whose legal rights have been restricted by harassment. If you were to pursue instances of hostile environment harassment and mobbing, which pose a severe threat to victims, this would help to fill the present gap in protections. What is the policy of your office? Kindly inform me if and under what circumstances you do actually step in and use this or other law to protect victims of harassment or to hold landlords to account. Do you have the staff such as trained investigators and attorneys available to carry out such interventions? Do you need additional staffing and funding to carry out such interventions? Is additional legislation needed? How might a victim or mandated reporter seek your intervention? I served as a member of the Commission to Study Ways to Prevent Bullying of Tenants in Public and Subsidized Multifamily Housing pursuant to Chapter 2 of the resolves of 2016. I helped to lead extensive research, including a survey and with input from a variety of stakeholders. I attach my report done on behalf of the Commission on Bullying [Available on request at http://stopbullyingcoalition.org/contact]. Additional background is available at StopBullyingCoalition.org.